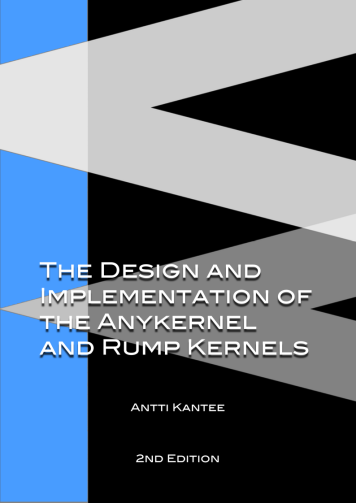 The 2nd edition of "The Design and Implementation of the Anykernel and Rump Kernels" is the definitive technical guide to the core of the Rump Kernel project. 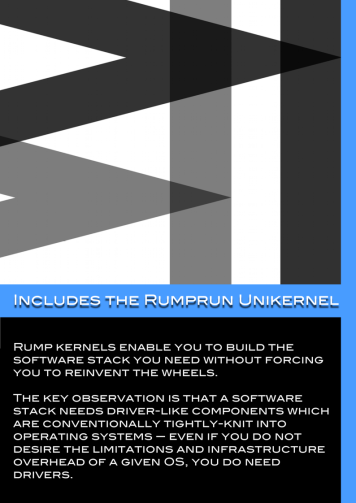 The book is available as a free-to-download pdf by clicking one of the cover images below. Epub and print-on-demand versions may be offered at a later date. If you find the book useful, you are welcome to show your appreciation by donating a sum of your choice to the author via the link above. If you have a hard time choosing a sum, the suggestion is half of what you paid for the previous tech book you bought. Note: even though the book is available free of charge, the contents are copyrighted. Please respect the licensing terms at the beginning of the book. Spoiler alert: if you do not redistribute the book, you do not need to look at the license.